After a few weeks of focus in both the nutrition and exercise departments, I'm feeling pretty damn awesome. I'm fitter, I'm leaner, I'm less achey, plus in the mental health department... well, let's just say things are about as close to Zen as an obsessive control freak is ever likely to get. Whilst I can see the obvious changes on the outside, I'm also keen to see what effect my lifestyle overhaul is having on my insides. I was supposed to get a cholesterol test done at the end of January, but do you have any idea how hard it is to fit a fasting blood test into a busy schedule? What with morning training, a long commute to work and some extra family obligations over the past few months, there was barely a spare minute anywhere. Finally though, I squeezed it in a week or so ago and I'll be following up on the results later in the week - which will probably be accompanied by a good telling-off by my doctor for being so late. And then I'll be getting it checked again in three or four months' time to see what progress I've made. - Maintaining a healthy body weight. Being overweight adds significantly to your risk of heart disease. - Don't smoke. Just don't. - Be physically active. The recommendations that get thrown around tend to focus on aerobic exercise, but throw in some resistance training too and your heart will thank you. - Eat balanced meals with lean protein, plenty of veggies, some fruit and whole grains and some "good" fats. I can tick all those boxes: Weight is sitting pretty right where it ought to be in the high fifties (yay! ); thankfully I've never smoked; I'm getting in an average of an hour of exercise a day including a couple of weights sessions each week; I'm not (very) stressed, mainly thanks to making more effort with organisation; and my nutrition is soundly based around whole foods in the 40/40/20 (protein/carbohydrates/fats) range. I've also continued to swap Dairy Farmers' Heart Active for my old brand of milk and am adding it to my breakfast porridge and to various recipes, so I'm bombarding my body with a daily dose of plant sterols. Take that, high cholesterol! Oh, the external result of all this focus and dedication? 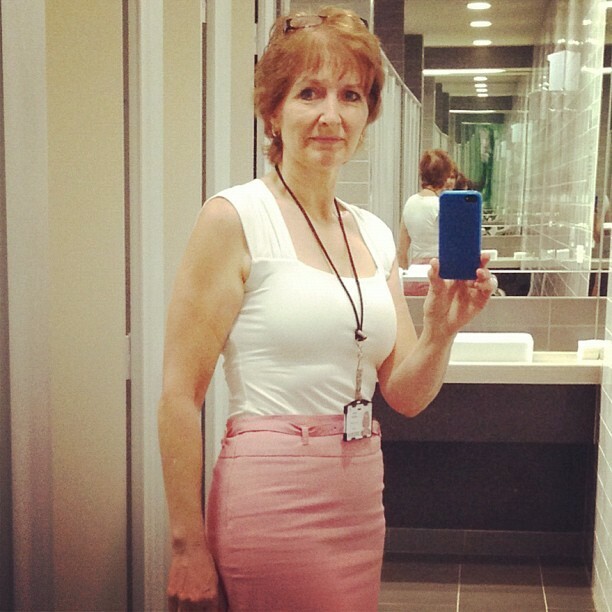 5kg gone and enough confidence to tuck my top into my skirt, as seen below. Excuse the rather sober expression; taking selfies isn't really my thing. Also, the fluorescent lighting in the Ladies' room at work is not exactly flattering. I shall try to do better in the medical checkups department. Perhaps if I put it in ALL my diaries: my paper one, my phone, home computer and work email, and then write in biro on the back of my hand, I might remember. Thanks Maryanne! Yes, I've always been all about FEELING great as well as LOOKING great. There's no point looking fab and feeling like crap, after all, is there? Well know Kerryn for losing 5 kg! Good on you! You look stunning that's for sure. After several failed attempts, I've started eating clean (AGAIN) on Monday. I'm really keen on losing weight but struggling with motivation. If only I liked exercising! That would make things easier. I've started Hypoxi again, it's so bloody expensive that at least I feel obliged to be a good girl when it comes to eating! Also starting Weight Watchers in a few weeks (with work). Of course all my work mates say I don't need but at the end of the it's about how we feel not how people perceive us, isn't it? Is that supposed to do that?